“Imagine phones and laptops that never heat up or power grids that never lose energy. This is the dream of scientists working with so-called high-temperature superconductors, which can effortlessly carry electrical currents with no resistance. The first high-temperature superconducting materials, called cuprates, were discovered in the 1980s and would later be the subject of a Nobel Prize. The term “high-temperature” is relative—these materials operate at frosty temperatures of up to minus 135 degrees Celsius, a bit higher than their traditional counterparts, which work at even chillier temperatures near absolute zero (minus 273 degrees Celsius). Despite the fact that high-temperature superconductors were discovered three decades ago, researchers are still scratching their heads over how the materials work. Scientists know that the answer is related to electrons sticking together in pairs, as if glued together, but the nature of the electron “glue” that binds them is unknown. Pinpointing the glue could ultimately lead to the creation of room-temperature superconducting materials and pave the way for energy-saving computers and a host of other innovations, such as levitating trains. Caltech’s Garnet Chan, Bren Professor of Chemistry, is attempting to crack the problem with a slightly different approach: quantum chemistry. He and his colleagues develop numerical simulations that, using the equations of quantum mechanics, map out the fluid motions of electrons in various materials. 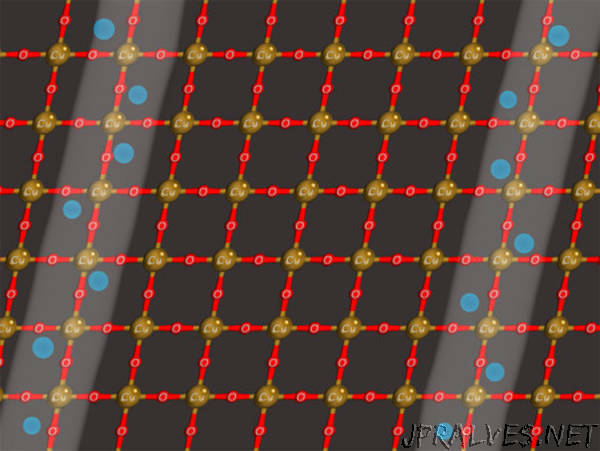 In a new paper in the journal Science, they have shown that high-temperature superconducting materials order themselves into a striped pattern of charges—what Chan and colleagues call “rivers of charge”—just before they become superconducting. By carrying out incredibly precise numerical simulations, Chan and his collaborators were able to rule out all the other candidate patterns of charges in favor of the striped state. In the new study, Chan and collaborators at multiple institutions used four very different types of numerical methods to simulate high-temperature superconducting materials. In general, scientists describe these materials using the Hubbard model, a mathematical model developed in the 1960s that explains the electronic behavior of many materials—in particular those exhibiting high-temperature superconductivity. Although the equations of the Hubbard model are relatively simple, solving them for the behavior of the electrons requires computing power. That’s where the new numerical methods helped out: they predicted how the electrons are organized in the materials with improved precision, and they showed that the charges spontaneously organize themselves into the striped patterns.